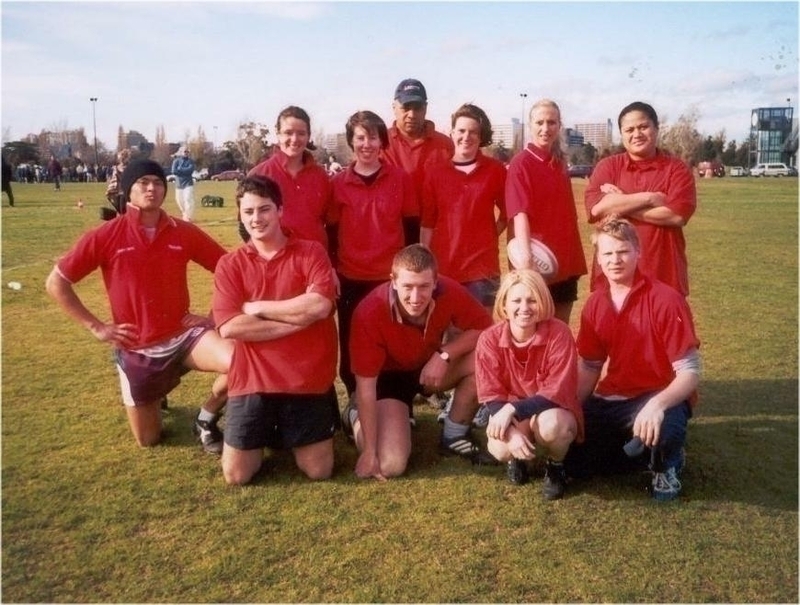 The 2002 Masters games premier rugby grand final was a much anticipated game played in front of a large crowd in Parkville, Melbourne. The Melbourne Vikings team were heavily favoured to dispatch Harlequin Academicals having some extremely talented and experienced players. And although it took a while for them to open the scoring against their plucky opponents they ultimately didn’t disappoint. At the beginnging of the 2001 Winter season it was a toss up whether touch over winter was a goer. Albert Park was a At the beginnging of the 2001 Winter season it was a toss up whether touch over winter was a goer. Albert Park was a long way from North Carlton and it get’s cold at 9.00 PM in the middle of Winter.But we decided to go for it. As close to half the Summer team no longer lived in Melbourne we needed some new recruits.Christine Williams recruited Alex Farani and I solidified the Kiwi connection by getting Andrew and Ursula Davis onboard. After some close wins in the grading matches we were drawn in B Grade where some pundits claimed “as touch players we play rugby well” and will “struggle to cut it”. Read it and weep Kelly-Ann!Despite this we won our first 6 games over some sides with some very stupid names.We then drew with Superfreaks before our team undermanned by a breakdown on the Westgate Bridge suffered our first loss to the Cool Cucumbers 6-5.In what was also the game of the now infamous “tackle”.Can I just say now it was an attempted intercept and I feel two weeks was unduly harsh. It was time to step and and we did going on a winning sequence leading us to the grand final. Its fair to say everyone played their best game in the big one. Brigid stepped into the breach for Debs and despite the Cool Cucumbers bombing some tries our defence was excellent and our attack as always great. But close to full time the score was 6-4 with the Cool Cucumbers attacking our line and potentially only one score from tieing it (girl tries were double points). But Andrew Davis intercepted and managed to waste at least a minute standing in the in goal, he touchdowned as the hooter went and the crowd (of about twenty0 went wild.Deserved winners 7-4. Throughout the season all the girls improved incredibly, especially Shelley (more a return to form), Maya, and Becs. Chris and Ivan’s experience was invaluable, and Cusack as usual you are a star. Alex was also a very deserved winner of the Best and Fairest and also now top try scorer for the Auckland and Melbourne rugby leagues as well as Wednesday Mixed B touch. People have aked me why I sign my emails with the above quote. For those of you who know little of Hazlitt he was an essayist of Irish extraction with some pretty radical ideas, for his time. Yet the reason I append the above to my epistles is twofold, admiration for the man more than his beliefs, and a strong belief in the statement itself. You see Hazlitt was that rare thing in the modern age, he was self taught, and whilst I disagree with many of his political opinions, his clear reasoning and assessment of human nature are unparalleled. Sitting on the Number 8 tram on Melbourne’s St. Kilda Road certainly is an interesting experience. Trams catch the mood and feel of Melbourne like no ther form of transport. They amble down the middle of the street they are amongst the traffic, yet they are not a car or a bus. They are not just a tool of commuting but of travel, so are uniquely placed for the observation of humanity in its day to day endeavours. Basketball riots in Los Angeles, football riots in Belgium. The weekend seemed to be full of mob violence, destruction and thuggery. Grown men on rampages of destruction. In the modern world, it seems that for all our technical achievements, our ordered society, and our high culture, we have not come that far. Just below the surface, barbarism is always there.